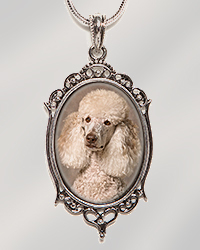 Custom Pendants to display your child's or pet's portrait are sure to attract attention from others. 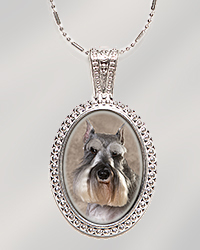 These personalized jewelry items are elegantly finished and contain a permanently mounted custom photograph of your choice. 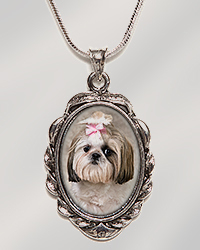 A variety of sizes and styles are offered for you to choose from, with matching necklaces in a variety of styles as well. 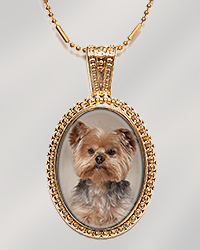 Very reasonably priced for custom-made jewelry, your pendant will be a favorite forever. 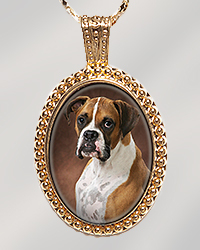 Images for the pendants are normally from images made by Terry Rowe, but it is also possible to have an image of your own put into a pendant. To do so you need to send the image to Terry. This can be a print or CD/DVD with the image on it (only the one image please) mailed to the address on the order sheet. 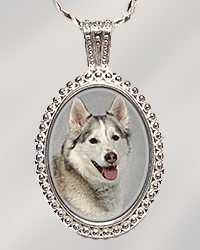 You can also email the image to Terry at the email address on the order sheet. 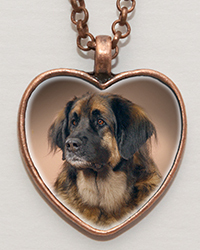 Please do not resize the image down from the original. 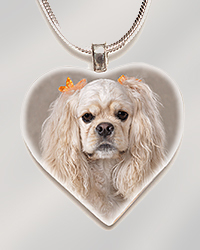 I will resize and crop the image to the appropriate dimensions for the pendant and will enhance the color to make the image as high quality as possible. (The quality of the final result will depend on the quality of the original material if you are supplying your own image.) If you have questions about this I will be delighted to discuss the image with you and offer advice either by email or by phone (717-469-0377). Please download the Order Form and print it out to send an order. Prices are on the order form. Shipping is $2.50 per item.